Last Saturday, the Brogden Bay Presents series hosted veteran roots performers Mollie O’Brien and Rich Moore in an evening concert at Larry Janss’ Four Friends Gallery in Thousand Oaks. The husband-and-wife team entertained with their diverse musical explorations, which ranged from folk and blues to country and pop-rock, all highlighted by O’Brien’s sweeping vocals and Moore’s scintillating guitar picking. 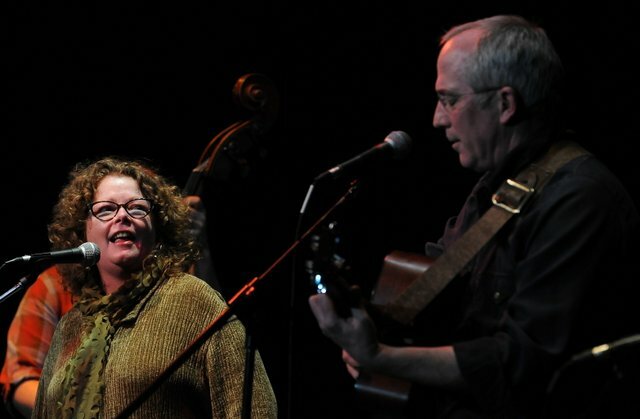 O’Brien began her career singing R&B and jazz, often joining her younger brother Tim, but in 1981 she met Rich Moore at the Denver Folklore Center and the two have been a team ever since. Moore, a laconically charismatic guitar player who can play in just about any style he chooses, proved to be the perfect foil for O’Brien, who at 64 still possesses a ravishing and versatile singing voice. At one moment O’Brien can sound like the folk-revival-era Judy Collins and at the next rock out like Linda Ronstadt or moan a blues like Bonnie Raitt. There just doesn’t seem to be any style she cannot sing, and sing well. Although not a songwriter (“I’m too wordy,” she explained), O’Brien has the ability to make any song her own, imbuing it with her own sensibility. An example is her fondness for the works of Roger Miller. A song stylist and unique personality in country music during the ’60s and ’70s, Miller’s writing was alternately playful, whacked-out or indescribably poetic. O’Brien does wondrous things with the works of many singersongwriters, unafraid to attach herself to indelible personalities like Tom Waits or Harry Nilsson, painting new shades to the coloring they’ve created. One of her best numbers of the night was the wryly humorous “Losers,” an obscure track from “The Mayor of MacDougal Street,” a 1964 Prestige LP by growly-voiced Greenwich Village folkie Dave Van Ronk. The most poignant moment of the night may have been O’Brien’s heartfelt tribute to her home town of Wheeling, W.Va., as she sang Hazel Dickens’ “West Virginia, My Home,” sounding almost like the late silky-voiced folk singer Kate Wolf. Moore provided intricate three-finger picking on guitar, faultlessly morphing from one style to another. His preferred method appears to be patterned after the late country music legend Merle Travis, but Moore’s guitar work is endlessly fascinating to watch, especially when he engages in string-bending blues like Memphis Minnie’s “In My Girlish Days” and, best of all, Percy Mayfield’s funky “River’s Invitation,” a popular number in jazz circles. During their concerts, many music performers in 2017 make passing comments regarding the current political situation—from straightforward criticism to carefully disguised innuendo.